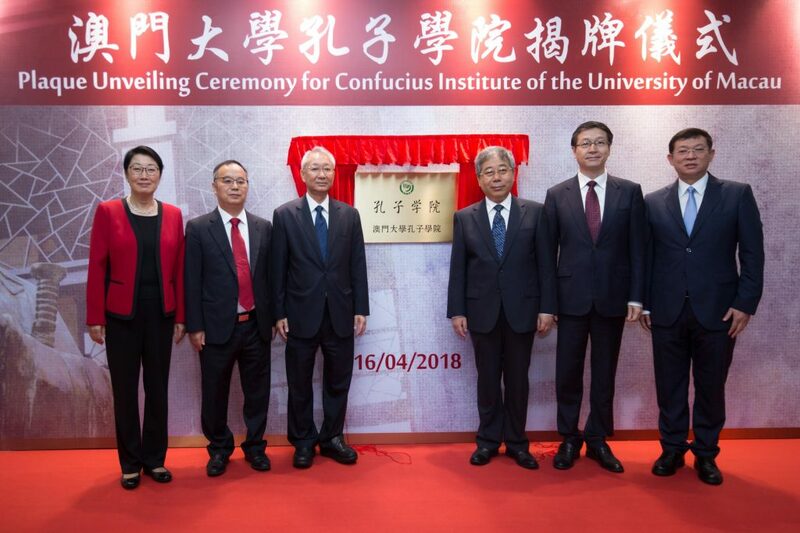 An unveiling ceremony for The Wall of Great Wisdom, a gift to the University of Macau (UM) from the Ministry of Education, was held on 16 April. The gift is testament to the central government’s concern and support for the development of education in Macao. The sculpture bears UM’s university motto and represents its goal to produce graduates with great knowledge and great character. It also symbolises UM’s effort to promote fine Chinese traditions, culture, and virtues. Chen Baosheng, minister of education of China, said that the Wall of Great Wisdom is more than a gift from the Ministry of Education; it also conveys the high expectations of the central government for the university. Guests attending the unveiling ceremony included Chui Sai On, chief executive of the Macao SAR; Chen Baosheng, minister of education of China; Sun Da, deputy director general of the Liaison Office of the Central People’s Government in Macao SAR; Tam Chon Weng, secretary for social affairs and culture of Macao SAR; Lam Kam Seng, chair of the UM University Council; Gao Hong, party secretary of the Central Academy of Fine Arts; Xu Tao, head of the Ministry of Education’s Department of International Cooperation and Exchanges; Liu Jin, head of the Ministry of Education’s Office of Hong Kong, Macao and Taiwan Affairs; Lu Yugang, head of the Ministry of Education’s Department of Basic Education; Liu Guiqin, head of the Ministry of Education’s Department of Social Sciences; Yonghua Song, rector of UM; Ouyang Mingcong, director general of the Board of Directors, UM Students’ Union; Chen Xiangdong, president of the General Assembly of UM’s Postgraduates’ Association; and Kot Man Kam, director general of UM’s Alumni Association. In his speech, Chen said that UM has a short history of a little more than 30 years, which is a blink of an eye in the world history of education. However, thanks to the joint effort of its faculty members and students, UM has experienced rapid growth within such a short period of time, which is nothing less than a miracle. This is especially true in the two decades after Macao’s return to the motherland. Chen added that in recent years, UM has set the goal of becoming a world-class institution, and has made significant contributions to the socio-economic development of Macao. As he recalls, in 1985, the Ministry of Education gave the Nine Dragon Wall to UM as a gift, which conveyed the hope for the university’s fast development with the support of the local community and the central government. He feels pleased that UM has lived up to the expectations and has become a fast-growing university under the leadership of the Macao SAR government and with the support of current and former chief executives. 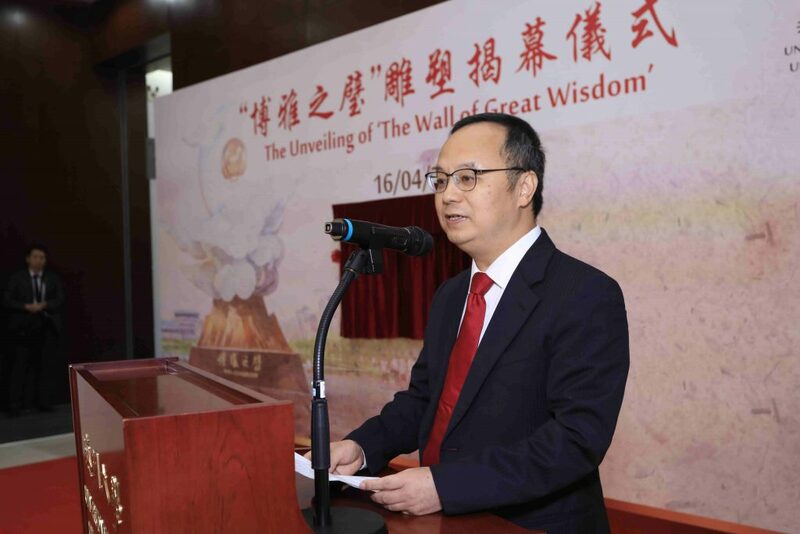 Chen Baosheng said that with the new campus ushering in a new era for UM, the Wall of Great Wisdom represents new requirements for UM members. It is more than a gift from the Ministry of Education; it reflects high expectations from the central government. The first Chinese character in the name of the gift, Bo, conveys the hope that UM faculty and students will strive to be knowledgeable and broad-minded. The second Chinese character, Ya, conveys the hope that UM members will cultivate refined behaviour and healthy hobbies. The two provide internal and external impetus for personal growth and are part of the guiding principles for educational development in China. The last Chinese character in the name, Bi, means an instrument used in ancient China for sacrificial purposes. It can be considered a carrier of the Chinese culture. Today, the Wall of Great Wisdom was gifted to UM by the Ministry of Education. It is expected to turn a new page in the university’s history. It is hoped that by understanding the profound historical meanings associated with the Chinese name of the gift, UM will be motivated to fulfil its historical mission to produce exemplary graduates who can serve the country, contribute to the rejuvenation of the Chinese nation, and support the long-term prosperity and stability of Macao. It is also hoped that the university will develop into a renowned institution both in China and in the world. In his speech, UM Rector Yonghua Song explained the design of the Wall of Great Wisdom, saying that it is a sculpture with a novel and elegant design as well as a profound meaning. The golden, hill-shaped base signifies the central government’s concern and support for the development of education in Macao. The rising, auspicious clouds stands for the healthy development and steady growth of UM and Macao amid an atmosphere of harmony. 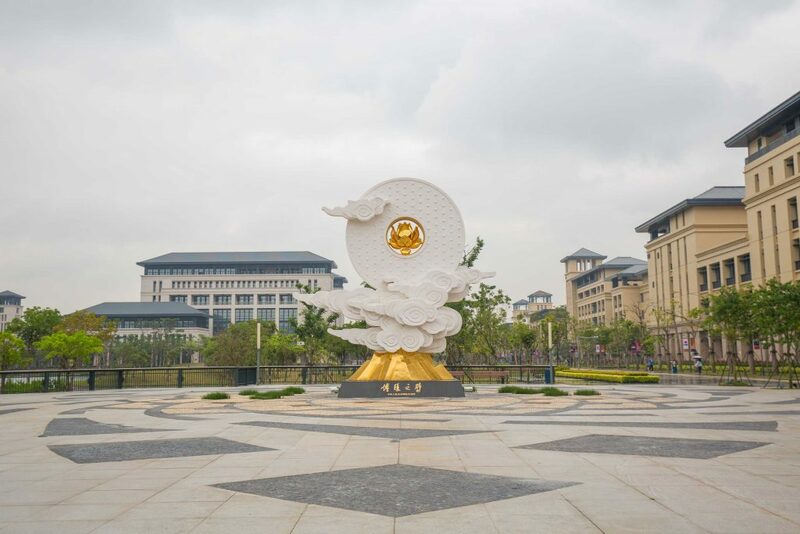 The main part of the sculpture, in the shape of a jade ring, is engraved with the five virtues of an ideal scholar, listed in the university motto, namely humanity, integrity, propriety, wisdom, and sincerity. The inscription of the traditional values conveys the expectation that UM will promote fine Chinese traditions and culture. The golden lotus in the sculpture echoes the ‘lotus spirit’ that is an integral part of the Macao culture. The Wall of Great Wisdom is inscribed with the university motto, reflects the spirit of Macao, and conveys the good wishes and expectations from the central and Macao SAR governments. UM members will remember the good wishes and expectations of the central and SAR governments, uphold the spirit of Bo and Ya in university education, and take it upon themselves to promote the fine Chinese traditions and culture. After the ceremony, Chen Baosheng; Sun Da; Lam Kam Seng; Yonghua Song; Ma Jianfei, party secretary and deputy director-general of the Confucius Institute headquarters and deputy director of the Office of Chinese Language Council International; and Hong Gang Jin, dean of the Faculty of Arts and Humanities at UM officiated at the unveiling ceremony for the Confucius Institute at UM. The Confucius Institute at UM has the unique advantage of being located in a multilingual and multicultural society that is a special administrative region to which a special political system applies. The institute will make full use of this advantage to pursue international collaboration, especially with Portuguese-speaking countries, in Chinese language teaching, learning, and teacher training, as well as to establish a communication platform to promote such collaboration. The delegation from the Ministry of Education also visited Ma Man Kei and Lo Pak Sam College.